I’ve been wondering about one thing for quite sometime now. Why isn’t Mercedes Benz putting the M266 into more of it’s cars? Where does the engine come from? Is it a Mercedes Benz development used solely in vehicles like the A-class and B-class or is it shared with other cars like Chryslers? As far as I know, Chrysler inline-4 engines use the GEMA engine (4B11) found in Mitsubishi, Hyundai and Chrysler cars. The M266 comes in a few displacements, but one of the most notable ones is the M266 Turbo (M266.980), found in the Mercedes Benz B200 Turbo. Unlike Mercedes Benz’s other inline-4, the M271 Kompressor which uses a supercharger, the M266 Turbo uses a turbocharger. It is mounted transversely and is mated to either a 6-speed manual or an AUTOTRONIC CVT gearbox, sending power to the front wheels. It uses a BorgWarner K03 turbocharger. The M271 is a longitudinal rear wheel drive design. Here is a comparison table between the M266 and the M271. The M271 specs used in this comparison is of the W204 C200K specifications. The M271 comes in different specs like different boost levels, which result in different performance statistics. Note that the W204 C200K’s M271 is not the most powerful M271 around, with factory tuning of course – the W203’s C230K has a slightly higher power output (192hp). Based on the comparison table above, which engine looks like the better performer to you? 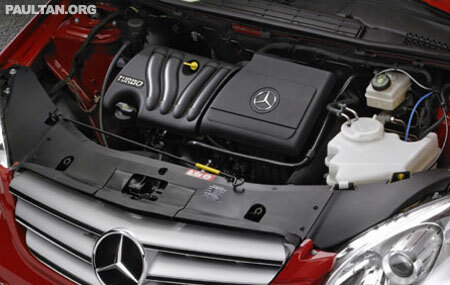 I’m not sure why Mercedes Benz has two inline-4 engines. It should just pick one and stick to it, economies of scale are better that way. Maybe the M266 could be adapted to rear wheel drive, or the M271 could be adapted to front wheel drive, though I think the former is easier, plus the M266 is a newer engine anyway and its performance looks better to me. However some might be turned off by the 8-valve SOHC valvetrain design, but then again what does that matter when the performance results are there? Power peaks earlier in the rev range, and torque has a wider spread and kicks in lower and stronger. DaimlerChrysler is currently using three different inline-4 engines in it’s cars, the GEMA 4B11 engine, the M266 and M271. There is no place in the world’s automotive industry for inefficiency. Everyone is sharing components – a recent example would be BMW and Peugeot sharing a common engine with different configurations for the MINI Cooper and a few Peugeot models. These are just my thoughts – if anyone knows these two engines in further technical depth and know why both need to exist, please do share in the comments for the benefit of all motorheads!